The inaugural vintage accessories auction at Sworders not only brought the saleroom a whole new audience, they also boosted prices for items that usually sell for less when lotted for general and other sales. New faces packed the Stansted Mountfitchet saleroom, while the phones were ringing off the hook as online bids came flooding in. The 240-plus-lot sale presented a wide range of celebrated international designers, including Gucci, Salvatore Ferragamo, Hermès, Dunhill, Cartier and Chanel, and included bags, clothes, shoes, accessories and more. One of the star lots was a rare Ralph Lauren Ricky handbag, a limited edition gift handed to private guests at the opening of the new Ralph Lauren store in Hong Kong in 2013. The alligator-skinned Ricky bag – inspired by a vintage English saddlebag and named after the designer’s wife – would normally sell for around $20,000. Accompanied by a personal handwritten note to the vendor from the Ralph Lauren Asia team, it also came with the original box, dust bag and authentication card. Selling for a healthy £6000, the proceeds will go to the child bereavement charity Grief Encounters, whose patron is Kevin Wells. The charity helped his son Oliver after their daughter and sister Holly was murdered in Soham. However, perhaps the most interesting performance of the day came for a less expensive item, a lady’s full-length mink-lined gaberdine raincoat, originally from Hunter Furs of Bond Street. Estimated at £100-£200, it reached a hammer price of £750. “If this coat had been included in a more general sale, it wouldn’t have made such a remarkable sum, but the focused attention of bidders attracted by the accessories and vintage format undoubtedly helped push up the price,” said Guy Schooling. 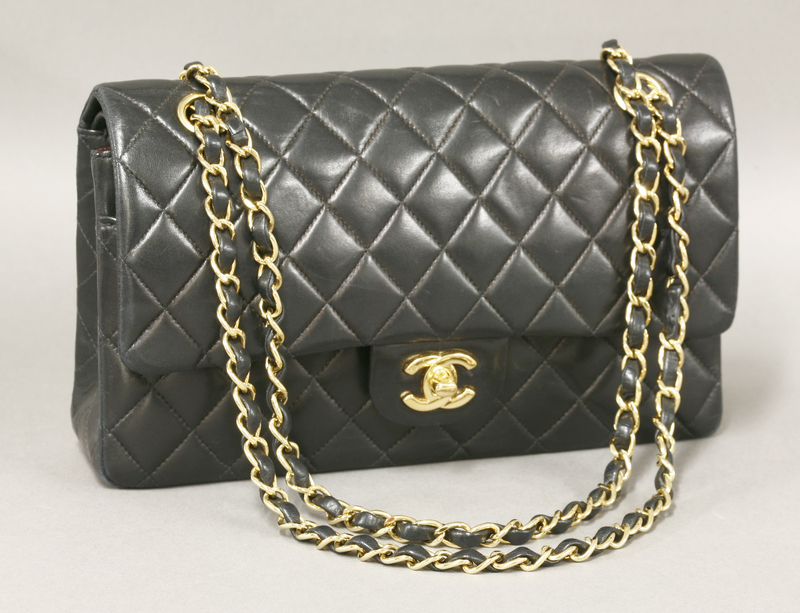 A Chanel classic Coco black quilted lamb double flap bag with serial number visible came estimated at £200-£300 and made £550.